Make kimchi from scratch with this easy-to-follow recipe from delicious. reader Trish Carty. First, put the cabbage into a large mixing bowl with the salt and massage it with your hands for a few minutes to release some of the water. Rinse the cabbage then add the filtered water, daikon and radishes to the liquid and set aside to brine for up to six hours. Drain, reserving 500-60ml of the liquid. Add the garlic, ginger, spring onions, red pepper powder, tamari and fish sauce to a mini food processor and blitz to a paste. Put the drained vegetables into a large bowl and mix with the paste, then pack into the mason jars, making sure there are no air bubbles in the liquid. Pour over the reserved brining liquid, making sure there is a 2-3 cm gap at the top to allow for expansion and put the lid on. The kimchi should be actively fermenting after 2 days. Allow the kimchi to ferment for 10-12 days in the fridge, but taste it daily from day 5 onwards to check the flavor and to see if there has been any accidental contamination. The vegetables should always be under the brining liquid. If using a Kilner jar, remove the seal before closing to stop pressure building up as the vegetables ferment. Open the jars once a day for the first few days to release any gas. 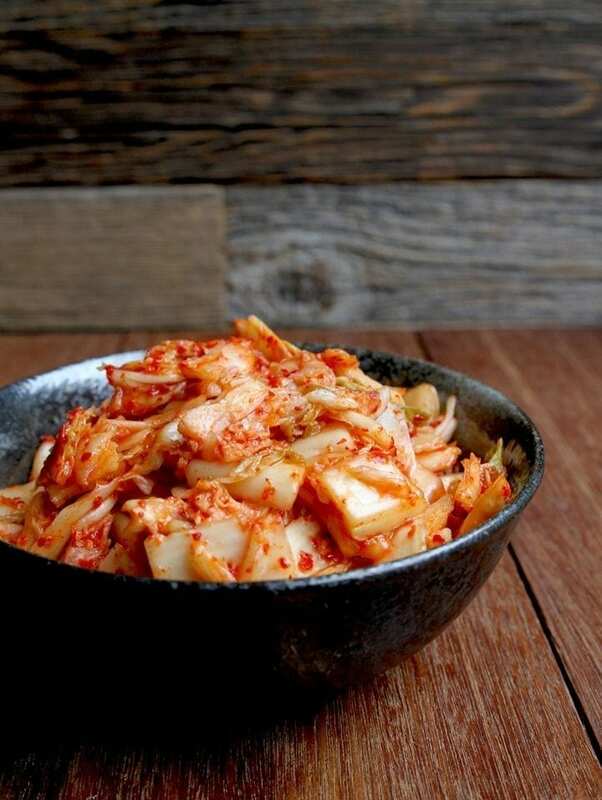 Want to know more about kimchi? Listen to Trish Carty explaining the benefits on our podcast here.